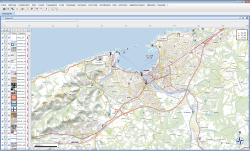 GeOxygene aims at providing an open framework which implements OGC / ISO specifications for the development and deployment of geographic (GIS) applications. It is a open source contribution of the COGIT laboratory at the IGN (Institut Géographique National), the French National Mapping Agency. 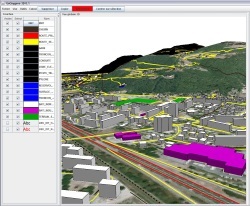 GeOxygene is based on Java and open source technologies and provides users with an extensible object data model (geographic features, geometry, topology and metadata) which implements OGC specifications and ISO standards in the geographic information domain. The support of the Java interfaces developped by the open source GeoAPI project is planned. GeOxygene is an open source project made available to you using an open source license described here. Expressive rendering tools and extension of the OGC specifications SLD and SE coming from the MapStyle project in the OpenGL rendering engine. Added linear stylisation to Line Symbolizer through the SE extension <ExpressiveStroke> . Added patch-fill rendering to Polygon Symbolizer, with graph-cut or alpha blending through the SE extension <ExpressiveFill> . 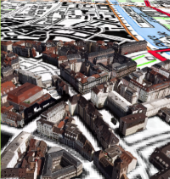 Added the possibility to set a global background texture to the rendered map through the SLD extension <Background> . Added Overlay, Multiply, Normal and HighTone blending modes between layers in Symbolizers through the XML tag <BlendingMode> . 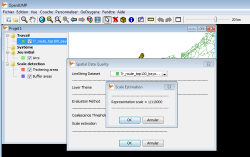 Enable animation of Raster Symbolizer + Tide simulation based on a DTM data, through the SE extensions <Animation> and <Tide> . Christophe S., Dumenieu B., Turbet J., Hoarau C., Mellado N., Ory J., Loi H., Masse A., Arbelot B., Vergne R., Brédif M., Hurtut T., Thollot J., Vanderhaeghe D. (2016). 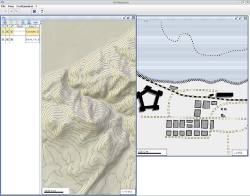 Map Style Formalization: Rendering Techniques Extension for Cartography, Pierre Bénard; Holger Winnemöller. Expressive 2016 The Joint Symposium on Computational Aesthetics and Sketch-Based Interfaces and Modeling and Non-Photorealistic Animation and Rendering, May 2016, Lisbonne, Portugal. The Eurographics Association, Non-Photorealistic Animation and Rendering. Masse, A. and Christophe, S. (2015) Homogeneous geovisualization of costal areas from heterogeneous spatio-temporal data, Int. Arch. Photogramm. Remote Sens. Spatial Inf. Sci., XL-3/W3, 509-516, doi:10.5194/isprsarchives-XL-3-W3-509-2015, 2015. 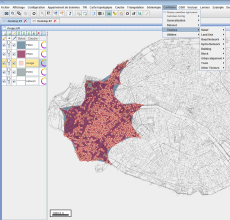 Students works : dot density analysis, measures of complexity of map. A “lenses” plugin that can : show a more detailed view over a less detailed layer, view a portion of the raster layer over the vector one, etc. OpenGL rendered 2D GUI added. Two demonstrations of using GeOxygene library at the GeoVIS Workshop, ISPRS GeoSpatial Week. Watch the video above ! Jean-François Girres intervention at Géoséminaire entitled Fondements théoriques et méthodologiques de la qualification des données géographiques showcased tools developed in his thesis to estimate geometric measurements imprecision on geographical data. 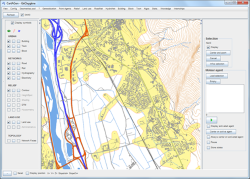 This new version includes the EstIM model developed during the Jean-François Girres PhD (2012), a new OSM module, new tools for managing style (editor, import and export SLD). The old GeOxygene 2D graphical interface and CartaGen graphical interface merge. 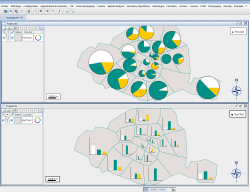 The presentation on GeOxygene 1.5 at FROG 2013 in Saint-Mandé will focus on the new features, including a description of the three new modules : geoxygene-semio (semiology), geoxygene-sig3d (3D) and geoxygene-cartagen (generalization). a new semiology module with a model of legend detailed here. Technically, the project has adopted a new multi-module Maven architecture. © Copyright 2016, Laboratoire COGIT, IGN. Created using Sphinx 1.3.6.